Published on May 18, 2017 in architecture and general info. Closed Tags: Boston condo market, Boston condominium market, Boston luxury real estate, Boston real estate, Boston sales outlook. I am reposting this Lovejoy Wharf story from Curbed.com and Tom Acitelli because it is so exciting to see it finally happening. I worked on this project pre-development at Coldwell Banker Residential Brokerage oh so many years ago. So happy to see the incredible Barbara Cusack named sales director for this Related Beal development. Sales at the 15-story, 157-unit Lovejoy Wharf building between the Zakim and Charlestown bridges are underway now. Prices range from $750,000 to north of $3,000,000; and the sizes of the units range from studios to 3-BRs. The project is a long time coming—planning for it began during the last decade and the development almost succumbed to a lawsuit from nearby property owners as well as to a once-faltering condo market. 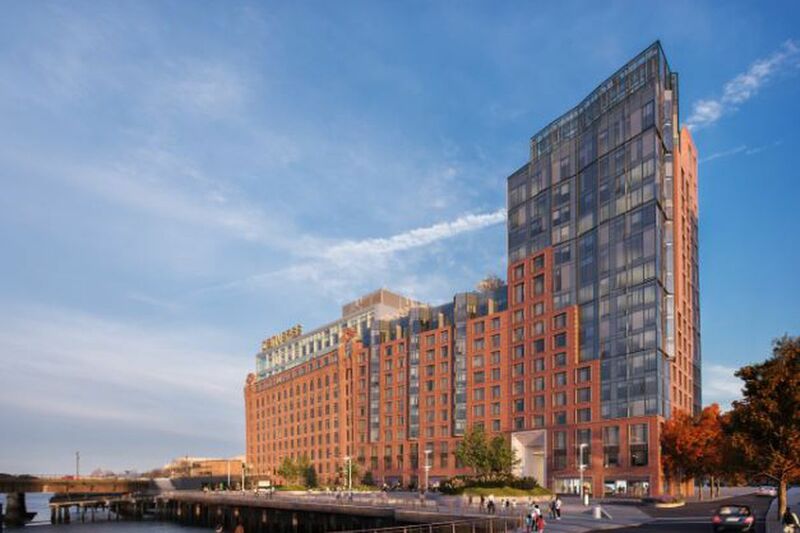 The building, which Robert A.M. Stern Architects designed and which Related Beal is developing, features all the usual bells and whistles, including a 24-hour concierge as well as a fitness center and a resident lounge. There is also a rooftop terrace on the 12th floor (rendered below). What Lovejoy Wharf will not have is parking for condo owners. After much hullabaloo, the city signed off on the project with no parking included, a break with longstanding Boston policy for such projects. The move, finalized in December 2013, made Lovejoy Wharf the first larger condo project in downtown Boston without parking for owners. Move-ins are expected to start this summer. Barbara Cusack has been named sales director for Lovejoy Wharf (she also handled deals for the Clarendon, another Boston condo that Stern designed and that Related Beal developed). A living room rendered. Note the Zakim view.